Today’s story teller is a neuroscientist, [W:Ryuta Kawashima]. 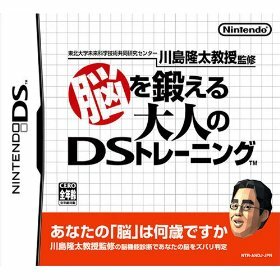 He is a central figure of the boom of “Brain Training” series games for the Nintendo DS, and very popular person in Japan. “I want to transplant my brain into a computer” Having such idea since he was 14 years old, he decided to study about brain, and 16 yeas later, he graduated with an MD at the school of medicine. When he ran against a wall during his studying life, he met this thesis that strongly shocked him. That was a Swedish neuroscientist, Per Roland’s thesis. Being impressed, Kawashima immediately wrote a letter to him saying “I would like to study under you” and he got response “Yes”. Since 1991 to 1993, Kawashima studied under Per Roland. The two years ware really fulfilled time to him. He concluded the article with his thought that although it would hardly realize to implant his brain to a computer while he is alive, just like he learned from Per Roland, he wishes that the next generation scientists go toward a “far away goal” by making himself a steppingstone.